“I am delighted to be here on this special occasion of the foundation stone laying ceremony of the Embassy building of the State of Palestine in India.This ceremony coincides with the State visit of President Mahmoud Abbas to India with whom I have just held very fruitful talks. I reiterated to President Abbas India’s consistent support to a negotiated solution to the Palestine issue. India believes that the solution should be based on the relevant UN Resolutions, the Arab Peace Plan and the Quartet Roadmap resulting in a sovereign, independent, viable and united State of Palestine living within secure and recognised borders, side by side at peace with Israel. India’s association with and commitment to Palestine is rooted in our modern history that goes back to our struggle for independence. As early as in 1936, a ‘Palestine Day’ was observed in India and fraternal greetings went out from Indian leaders to their Palestinian counterparts. Soon after independence, India had the privilege of serving on the United Nations Special Committee on Palestine formed in 1947 by the UN General Assembly. This step marked the beginning of our consistent support to the Palestinian cause in the United Nations and all other international forums. India recognized the Palestine Liberation Organisation as the sole representative of the Palestinian people in 1974. On March 26, 1980, India granted diplomatic recognition to the office of the PLO in New Delhi, two days before the historic first visit of Chairman Yassir Arafat to India. India accorded recognition to the State of Palestine soon after its proclamation in Algiers in 1988. India opened its Representative Office in Palestine in 1996. 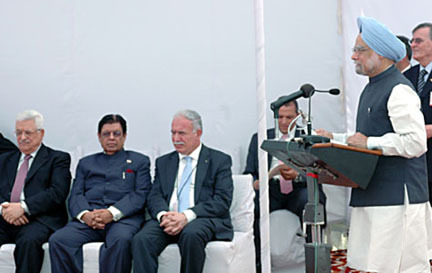 In November 2007, India participated in the Annapolis Conference on peace in West Asia in the hope that a determined process would be launched to secure Palestinian rights and achieve a just, durable and comprehensive peace in the region. That, regrettably, remains an elusive goal. Earlier this year, we were shocked and dismayed by the violence in the occupied territories, including in Gaza. We hope that wiser counsel will prevail and that the path of dialogue will remain the preferred path to realise peace in the region. India and Palestine have been steadfast partners over decades. It is only fitting that India’s commitment to Palestine and its future should find one of its embodiments in the building which stands before us. I have no doubt that it will serve as a symbol of our friendship and solidarity in the future. India will continue to do all it can to assist Palestine in all its endeavours, including in capacity and institution building. We have signed today an MoU to finance construction of a school to be named the Jawaharlal Nehru High School in Abu Dees near Jerusalem. I also have great pleasure in announcing a grant of 10 million US dollars as budgetary support to the Palestinian National Authority to help meet its immediate requirements and an additional 10 million US dollars as assistance for development projects.